General Mills has more office space than it needs and plans to sell or lease a building adjacent to its Golden Valley headquarters campus. 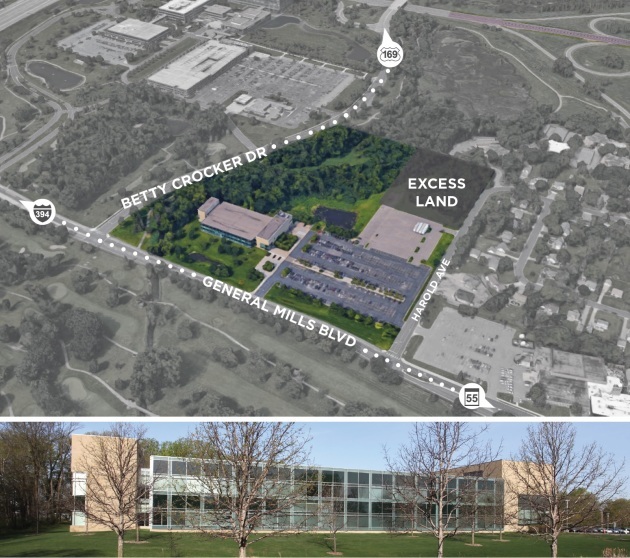 The Minnesota-based food maker will move the building's 200 employees across Betty Crocker Drive into open space in the headquarters complex -- which is composed of half a dozen connected buildings -- later this year, said company spokesman Rob Litt. The 90,000-square-feet building, called Bassett Creek, is located at 201 General Mills Blvd. and sits on nearly 20 acres, including natural wetlands. General Mills employs about 3,100 people at its home office. Most of the workers in its Bassett Creek building hold sales positions. With consumer dollars increasingly straying from some of the large household brands, General Mills and many of its big food peers focused on reducing costs to pad the bottom line. The maker of Cheerios, Nature Valley and Totino's products has trimmed its global workforce, including at its headquarters, by more than 5,000 over the last five years. In the last two years though, the food giant has refocused on topline growth, shifting resources into product innovation and marketing in the hopes of capturing the hearts (and dollars) of consumers. "We are always looking at ways we can be more efficient in how we operate to free up money to invest in driving growth for General Mills," Litt said in an email Wednesday. The building is being marketed by Cushman & Wakefield, which declined to comment. Marketing material lists the building's sale price at $11 million or a lease rate of $15 per square foot. Cushman & Wakefield marketing images of General Mills' office building that's for sale or lease. Great Clips among top 10 franchise companies.